My sugar level after 2 hours of food is 196. Is it very alarming. I do take glycomet one tab daily. Any suggestion for rectifying the level. I understand your concern! I have gone through your medical history carefully and understood your concern. A blood sugar level two hours after eating, in non diabetic subjects should be less than 140mg/dl. I see that you are taking glycomet, it makes me think you are a diabetic patient. It would be great if you could send the exact dose of glycomet recommended from your doctor. A blood sugar level of 196 mg/dl two hours after eating in diabetic patients is considered within the acceptable range. The oral hypoglycemiant med you are taking once a day is doing well in controlling your blood sugar levels so far. 1. Try to be more physically active. Walking or jogging for at least 30 min/day will also help keep your blood glucose within normal range. 2. Watch what you eat: stay away for high carb/high calorie foods. Instead, try to eat fresh and healthy foods like veggies, fruits, fish, etc. 3. There are certain herbs that have been shown effective in maintaining the blood sugar well controlled. 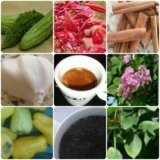 They include some spice such as cinnamon, herbs like fenugreek, gymnema sylvestre, bitter melon, etc. You can have them cooked or can take their extract in type of supplement. I would be glad to help you if you have any further questions! My name is Ravi Ranjan Kumar. Sir my sugar level in fasting 67 and after eating it goes 195 after tow hours please give me advice. Thank you for writing to us your health concern. You say that your fasting blood sugar level (fbsl) is 67, while 2 hours after eating it goes up to 195 mg/dl. Your fbsl is within normal range. For your information, normal fasting blood glucose should be withing 60 to 110 mg/dL. Yours is 67, which is perfectly normal. It tells you to start having your breakfast and feed healthy. - Normally, bg is raised after eating. However, 2 hours after having your meal, it is supposed to get down to normal levels. In your case, you say, that it goes up to 195 and does not get down. That is explained with the calories you have included in your meal. In other words, foods you consumed had much more calories than your body might assimilate. After 1 week of implementing such changes, measure your blood sugar after eating again, and record the result and write back to me. Hope this helps. Let me know if you need further assistance. I'd be glad to help you further. I'm also taking antibiotics, prednisone. Could that interfere with reading? I think your blood sugar is at borderline level. Yes, it's true that prednisone, and antibiotics will interfere with your blood sugar levels. I highly recommend to finish the current treatment with antibiotics and prednisone, wait for at least 1 week, and get your blood glucose rechecked again. 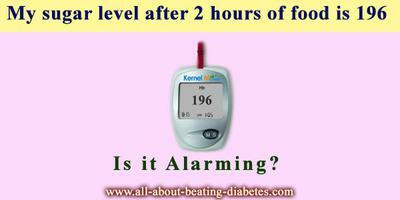 FBS = 81; After 2 hours after meal = 213; Am I diabetic? I just got my Diabetic package Lab test result. My FBS was just 81 but after an hour taking the juice that was given to me It went up to 213 then it went down to 163 after 2hrs. Am I really a diabetic? I do not think you are diabetic. It's normal for blood sugar to get raised the first hour more than the following hours. It depends on what you've consumed to cause raised blood sugar at this point (213). I advise to get your blood sugar checked at home, after 2 hours after eating. And should compare with the previous results. QUESTION: After take 2 time medicine ZORYL-MV2 my fasting sugar level is 75 & ppbs200 is it normal? You are reporting blood sugar level (bsl) at this moment, after taking this medication. I do not have your previous bsl. Can you please send them to me? As per your reports, your bsl are within normal range (fasting and after eating). I am worried about hypoglycemia you might be suffering in the following days. The actual treatment is doing a lot in reducing your bsl. So, if I was your caring doctor, would change therapy to monotherapy with metformin only. I think glimepiride inside Zoryl-Mv2 can lower bsl too much at hypoglycemic levels. Please monitor your bsl, record the results. Please send the previous bsl reports to me. Age of 36,Yesterday have check my blood sugar in fasting it was 108. After PP have taken blood test 1.30 hrs later it was 190... it was normal or high range....Any precaution to be taken....Kindly advise. Your fasting sugar is perfectly normal. Your PP sugar of 190 after 1.30 hours after eating is a bit higher than normal but still acceptable. You should wait for at least 2 hours before taking the test. It also depends on what foods/drinks you have consumed during your meal. I advise to avoid eating high calorie foods.